The condition of this vessel is impeccable. The headliners, cushions, carpets, paint, motor - all look in GREAT condition. 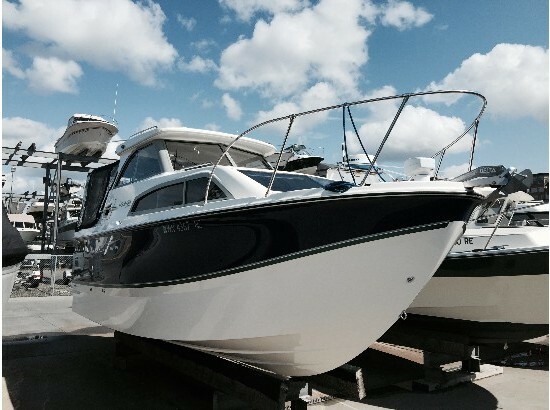 Virtually no defects and no damage seen on this carefully cared for and maintained Bayliner. Per the Seller: Stored inside and professionally winterized in 2013. As-new bimini installed with 1 new spare included! If you're looking for a day cruiser built to last with VERY LOW hours - THIS IS THE ONE! 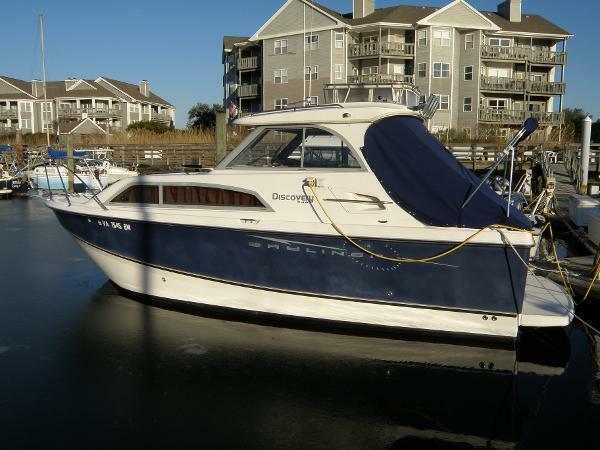 Stock #136195 Like new Bayliner Discovery 246 EC Cruiser. 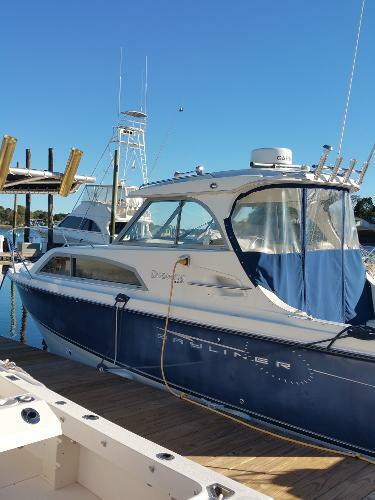 Only 80 hours on Yanmar DIESEL If you are in the market for an express cruiser, look no further than this 2007 Bayliner Discovery 246 EC, just reduced to $50,999 (offers encouraged). 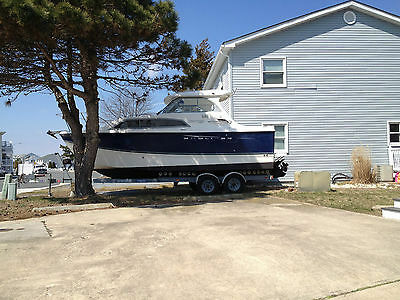 This boat is located in Hollywood, South Carolina and is in great condition. She is also equipped with a Yanmar engine that has only 80 hours. Reason for selling is time for new adventures. 2008 Bayliner Discovery 246 2008 BAYLINER DISCOVERY 246 HARDTOP 2008 Karavan Trailer 5.0 motor A/C Heat, Microwave, Fridge, Hot Water, Alcohol/Electric Stove, SS Sink, TV, Stereo w/CD, DVD Head with Shower plus Transom Shower, Wash Down Pump, Windlass Fish Package-Rocket Launchers, Rod Holders in cabin Lowrance Fish Finder/GPS, Marine Radio 2 New Batteries, Camper Top, Mooring Cover GREAT - GREAT LAKES BOAT Ideal for Fishing or Pleasure. --- READY TO GO. 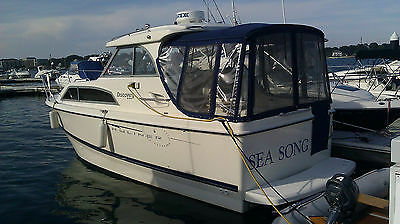 2007 Bayliner Discovery 246 One owner, mainly used for cruising. The Discovery 246 is extremely popular for families. 8 6 Beam creates the option for a trailerable Pilot Style boat. Deep V hull sleeps 3 people. Engines are clean and professionally maintained (800 Hours) with records available upon request. More information to come. 2007 Bayliner Discovery 246 This popular Bayliner Discovery 246 has been meticulously maintained with an open checkbook and she shows it! She is a great family boat for taking cruises on the open water and comes equipped with everything needed for your extended stays. She is powered by a Mercruiser 350 MPI Horizon engine with less than 100 hours that has been professionally maintained every year. Fish'N Thyme is located off-site and a boarding appointment will be necessary. STEAL THIS BOAT! $6,000 price drop due to unexpected immediate financial burden. I must pay off my boat loan!! Special Features: Huge chartplotter with RADAR!! !Exceptionally clean - NEVER BEEN FISHED. Use only 4 seasons - 2008, 9, 12, 13! Always winter shrink-wrapped.This boat has a current 2015 NADA average retail estimated value of approximately $48,000 for an 8 YEAR OLD 2007 boat, BUT........this boat is essentially only 4 YEARS OLD since it was used for only 4 seasons! Even BoatUS Insurance had an agreed insurance value of $50,000 for my policy in 2013. It is still winter shrink wrapped but is still very able to get inside to view engine and interior. For a seriously interested buyer, I can hook it up to water to run the engine. If after viewing you are further interested I will remove the shrink wrap, install the camper canvas and wash the boat.Too good to pass up. You can't buy any other boat of this style, this new, with such low hours, with this many options for this price, and Bayliner doesn't even make this style anymore so this is a rare opportunity for you to own an all-weather enclosed hardtop boat that's still good for fishing...if that's what you're into.Less than 70 HRS on single 5.0L MPI 260 hp Mercruiser with Bravo III outdrive with SS dual props. LOA - 25'8" x 8'6". 81 gal gas, 20 gal fresh water, including 6 gal hot water heater.LOADED: Full galley w/Tappan microwave - galley sink and head w/shower (see photos) - both with hot and cold water system - also H&C at transom shower. Reverse-cycle heat and air conditioning. Jensen sound system with CD player and mp3 input. Polaroid 15" Flat panel TV w/remote. Great view from cabin through slide open side widows with screens and full forward window, all with curtains.Cockpit seats 6 comfortably and has removable table, full snap-in carpeting and has full camper enclosure. Some screens could use some repair but isinglass windows are all in very good shape. Coupled with hardtop helm enclosure this makes for a great all weather home on the water. My wife and I lived on this boat for 3-5 days at a time. It's that nice!EXTRAS: Include Remote Spotlight, Sitex 11" gps/chartplotter, Sitex Radar, small backup GPS unit and Navman VHF radio w/DSC. Removable Magma gas grill that mounts on transom. 6 - 1/2" dock lines (4@24' and 2@14'), 5 fenders, 3 throwable cushions, 6 life jackets and 2 fire extinguishers. Manuals for all equipment including Mercruiser service manual. Many other small items and accessories included. Has been freshly bottom painted with Pettit Hydrocoat and installed all new zincs so it will be ready to put it in the water, turn the key and go. No trailer, but you get the stands and blocks included. STEAL THIS BOAT! $5,000 price drop due to unexpected immediate financial burden. I must pay off my boat loan!! Special Features: Huge chartplotter with RADAR!! !Exceptionally clean - NEVER BEEN FISHED. Use only 4 seasons - 2008, 9, 12, 13! 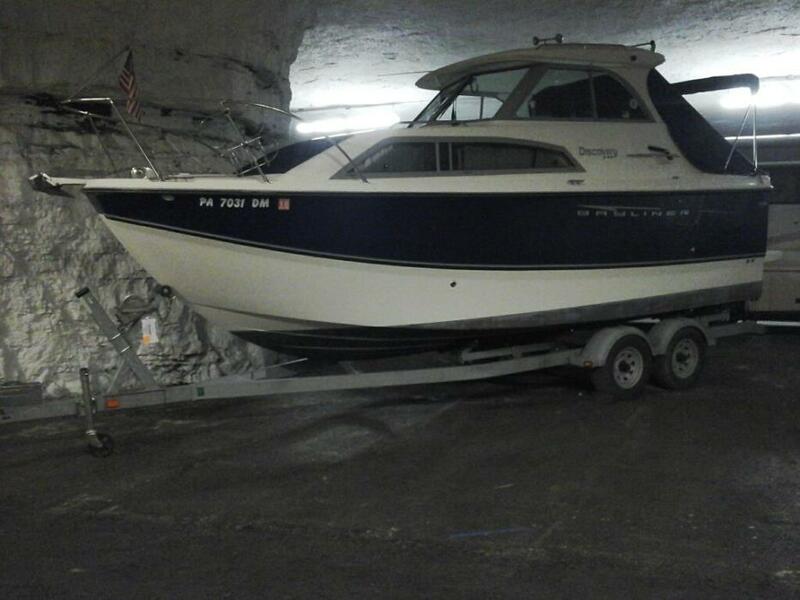 Always winter shrink-wrapped.This boat has a current 2015 NADA average retail estimated value of approximately $48,000 for an 8 YEAR OLD 2007 boat, BUT........this boat is essentially only 4 YEARS OLD since it was used for only 4 seasons! Even BoatUS Insurance had an agreed insurance value of $50,000 for my policy in 2013. It is still winter shrink wrapped but is still very able to get inside to view engine and interior. For a seriously interested buyer, I can hook it up to water to run the engine. If after viewing you are further interested I will remove the shrink wrap, install the camper canvas and wash the boat.Too good to pass up. You can't buy any other boat of this style, this new, with such low hours, with this many options for this price, and Bayliner doesn't even make this style anymore so this is a rare opportunity for you to own an all-weather enclosed hardtop boat that's still good for fishing...if that's what you're into.Less than 70 HRS on single 5.0L MPI 260 hp Mercruiser with Bravo III outdrive with SS dual props. LOA - 25'8" x 8'6". 81 gal gas, 20 gal fresh water, including 6 gal hot water heater.LOADED: Full galley w/Tappan microwave - galley sink and head w/shower (see photos) - both with hot and cold water system - also H&C at transom shower. Reverse-cycle heat and air conditioning. Jensen sound system with CD player and mp3 input. Polaroid 15" Flat panel TV w/remote. Great view from cabin through slide open side widows with screens and full forward window, all with curtains.Cockpit seats 6 comfortably and has removable table, full snap-in carpeting and has full camper enclosure. Some screens could use some repair but isinglass windows are all in very good shape. Coupled with hardtop helm enclosure this makes for a great all weather home on the water. My wife and I lived on this boat for 3-5 days at a time. It's that nice!EXTRAS: Include Remote Spotlight, Sitex 11" gps/chartplotter, Sitex Radar, small backup GPS unit and Navman VHF radio w/DSC. Removable Magma gas grill that mounts on transom. 6 1/2" dock lines (4@24' and 2@14'), 5 fenders, 3 throwable cushions, 6 life jackets and 2 fire extinguishers. Manuals for all equipment including Mercruiser service manual. Many other small items and accessories included. Has been freshly bottom painted with Pettit Hydrocoat and installed all new zincs so it will be ready to put it in the water, turn the key and go. No trailer, but you get the stands and blocks included. Click Here For Additional Pictures Will trade for a boat without a cabin plus or minus cash (similar nada book value) my boat is worth a whole lot more than what I'm selling it for. LOOKING FOR BEST REALISTIC OFFER. I HAVE A DEPOSIT ON A NEW BOAT, BUT I'M NOT TAKING DELIVERY OF THE NEW BOAT UNTIL APRIL 2015. If storage is an issue, the boat can remain in my driveway until until April 14th. ALL TRADE OFFER'S HAS TO GO THROUGH EBAY. I WILL CONSIDER TRADING IT FOR A NICE VEHICLE (PREFER A TRUCK) , RV OR OTHER TOYS NOTHING TOO OLD. Will trade for a smaller boat plus or minus cash (but be realistic) my boat is worth a whole lot more than what I'm selling it for. Please get your funds in order prior to contacting me. Thanks I RESERVE THE RIGHT TO END THIS AUCTION AT ANY TIME WITHOUT NOTICE. THE BOAT IS LISTED LOCALLY. 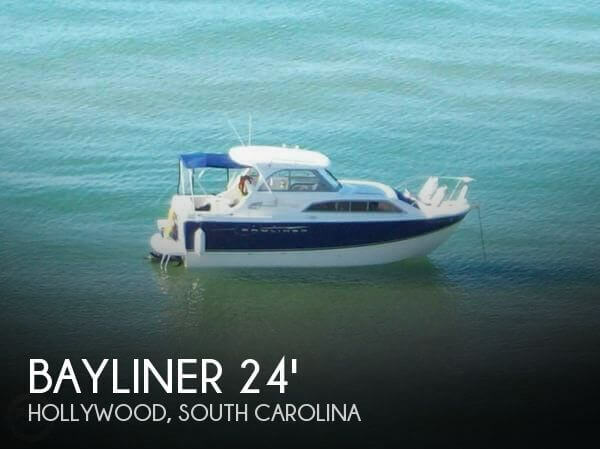 THIS IS THE LOWEST PRICED 2007 BAYLINER DISCOVERY 246 IN THE COUNTRY (IF NOT THE WORLD) AND IT HAS MORE OPTIONS THAN MOST, LOOK AROUND ON YACHTWORLD OR ANY OTHER SITE ON THE INTERNET. 2007 Bayliner Discovery 246 with a 5.0 Mercruiser MPI (359 hours mostly used to troll for Rock Fish, Striped Sea Bass) and Bravo III outdrive. Hardtop with full camper canvas that's never been used. Cabin is equipped with a stove, refrigerator, sink, a/c and heat. Boat's current book value is in the $40's. Boat comes with with self contained AC and heat (Marine Air Systems). The trailer was serviced on 2/27/2014 ($563). Used only ethanol free gas. New Garmin Fishfinder last year. New bellows and gimble bearing last year. New bottom paint 02/2014, but it has a couple coats of paint on the bottom. New Battery charger.